DesignApplause | kid o mini go cars. kid o mini go cars. The smaller version of our classic Go Cars for on-the-go fun! The curving roof does double-duty as a handle and the plastic wheels roll along any path. It has a curving roof that doubles as an easy to grasp handle and the wheels roll along smoothly. 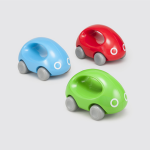 Mini Go Cars are brightly colored, shiny and smooth. These mini cars come in a variety of red, blue and green. 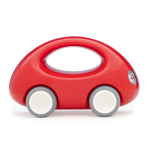 The Kid O Mini Go Car is PVC Free, Phthalate Free and BPA Free. For ages 1+ years. · gracefully curving roof acts as a handle.